Friday is usually a fun day for me because the work week is over and you have the entire weekend ahead of you. Normally my husband and I are so exhausted on Friday nights that we do something mellow like cook dinner and have a glass of wine or go down to one of our local restaurants. This Friday night we had our friends over for dinner. I wanted to make something that was whole30 compliant but also something that everyone could enjoy. I decided to make coconut chicken curry because when I made it during the first week of my whole30 it was so damn good that I knew everyone would like it. For breakfast I had my standard hard boiled eggs and veggie juice. This meal is generally what I have when I am pressed for time in the morning which is usually always. This is why I enjoy making a protein shake for breakfast so much. But I can’t have protein powder on Whole30 so eggs will have to do. I came home at lunch and prepped all the food for the coconut chicken curry and put it in the crockpot. This way I wouldn’t have much prep to do after work. Have I mentioned how much I love my crockpot aka slow cooker? It’s pretty great. Plus it was a rainy day here in Southern California which made my slow cooker just feel that much more special. If you notice in the picture, some of the food is NOT whole30 approved. I decided to serve the coconut chicken curry with cauliflower rice for myself, the whole30 person, and brown rice for everyone else. I made enough cauliflower rice for everyone to try some if they wanted. 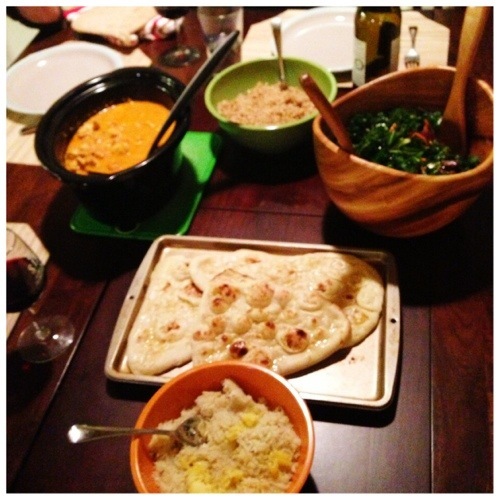 We also served the curry with Naan Bread. My husband was happy to finally get some bread back in his diet. I haven’t had bread in over 9 months now and honestly I don’t miss it one bit. To me bread reminds me of feeling sick and yucky. 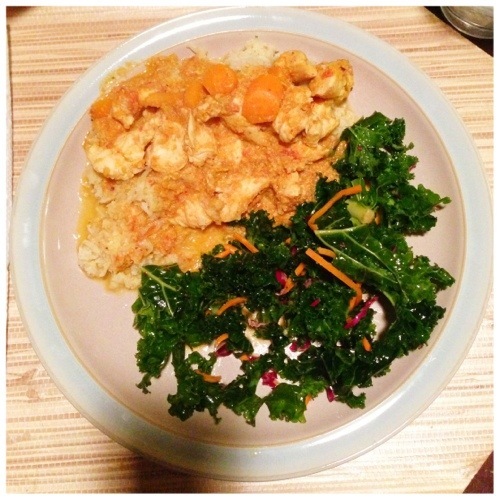 We also served the chicken curry with my favorite kale salad. I substituted apple cider vinegar for the rice wine vinegar and it was bomb. I think I just need to update the recipe now. It’s so darn good. Everyone enjoyed it! After dinner I realized I didn’t make dessert because dessert is just not something that has been on my radar in the past 19 days. This is weird for me because I used to love dessert. I guess I like the ritual of dessert more than the actual dessert now because I can just settle myself with tea and feel fine. Our friends were genuinely very interested in whole30 and we all had a great time. I honestly enjoyed cooking a whole30 meal and eating in more than I enjoy eating out. I like to go to restaurants but being gluten free has really changed my perspective on these things. Of course I still love a good night out and good, quality restaurant food. But the days of picking up take out on the way home from work are pretty much over for me. Now if I don’t already have a dinner planned and waiting for us when we get home, I go to the market and buy something to cook. The changing of the times I guess. Overall it was another great Friday on Whole30 and I am happy to be in such good company on my journey! What about you? Have you had lunch or dinners out with friends since being on the whole30? How do you handle those situations? Post in the comments and let me know. Your salad bowl looks really nice!